Service for a recurring fee is a win-win-win situation. Small-cap stocks have been one of the best-performing asset classes in 2018 so far. After years of barely keeping up with large-cap stocks, investors are finally seeing some benefits from owning smaller, up-and-coming businesses. 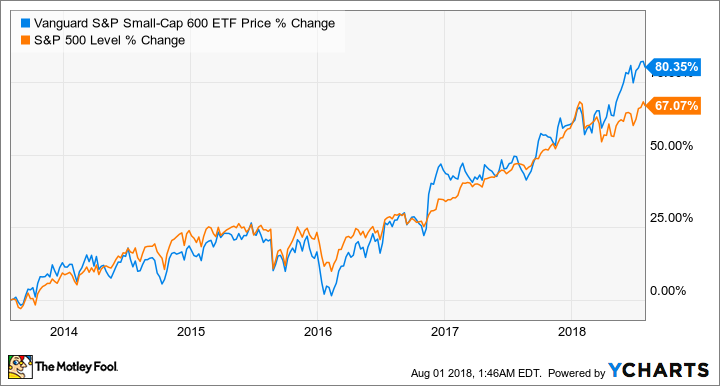 Even in spite of a rough start to the year, small-caps have been resilient and are sporting double-digit gains compared to the S&P 500's 5% return this year. Software-as-a-service (SaaS) providers are leading the charge. SaaS isn't new, but over the last couple of years the business model has begun to show its value. Even industries outside of tech have begun to test the waters with similar business models -- like the auto industry, for example. Critics of SaaS cite things high customer acquisition costs and higher cost to customers over time due to recurring subscription fees. Despite these concerns, SaaS is a winning strategy for everyone involved. For starters, let's define SaaS. SaaS in all of its forms -- like data-, transportation-, and AI-as-a-service -- shares a few things in common. The software is hosted and maintained on a central server (the cloud) by the developing company, and customers access it via an internet connection. Users pay a monthly, annual, or other type of term fee for access to the software. Salesforce (NYSE:CRM) was an early pioneer of this business model when it migrated its services to the cloud in the early 2000s. There were several benefits, including no need to install software on individual machines, service scalability with a business's growth, and instant updates to all users. The biggest benefit of all, though, is the cost savings over time with the pay-as-you-go model. If a company in need of a technological upgrade needs to pay for the project up front, a conflict often arises. A company needs to borrow money or use its cash reserves to fund the project, which could mean other projects are put on hold. Under a subscription model, the customer gets to keep its cash and gets the benefits of the upgrade immediately. Investors are familiar with the concept of cash now being more valuable now than cash later -- the time value of money. Here's that same concept applied to a payment structure over a 10-year period. In scenario one, a $100,000 project is funded up front; and in scenario two, it's paid for in equal annual installments of $11,000 (customers pay a little extra since payment is strung out over time instead of paid in full up front). Let's assume a rate of return on cash of 5% compounded annually -- the opportunity cost for parting ways with the money. Scenario one -- paying up front -- is by far the more costly option even though the annual installments add up to more than the up-front initial payment. Chart and calculations by author. End users of SaaS benefit from the business model, but so do the software companies selling the service. Many of the costs (with the exception of selling and marketing) are fixed since the software is centrally located on a server. Once a service acquires enough users, profits are scalable. The result is typically a high-profit margin business. Salesforce, an early adopter and now one of the biggest cloud companies in the world, is a prime example, but there are other smaller companies that are benefiting, too. Chart by author. Data source: company specific quarterly and annual filings. Because of those high margins, shareholders can be some of the biggest beneficiaries from the SaaS model. That's a lot of cash generation that these businesses can funnel into product improvement and innovation, marketing, and acquisitions, leading to even more growth. Just as important, though, is the consistent revenue generated by recurring fees, smoothing out results, and making future cash flows more predictable. An added bonus that has helped small-cap stocks out-perform this year is U.S. corporate tax reform passed in December 2017, making these high-margin businesses even more lucrative. SaaS companies are on fire, but investors should still be aware of risks. Many still run at a net or operating loss as they plow all of their extra cash and then some into sales and marketing. As a result, accelerating and decelerating customer growth figures can cause these stocks to be unpredictable. Volatility aside, though, as cloud-based software companies continue to grow their customer bases in this digital-first world, it looks more likely that their market-beating performances will continue over the long term.